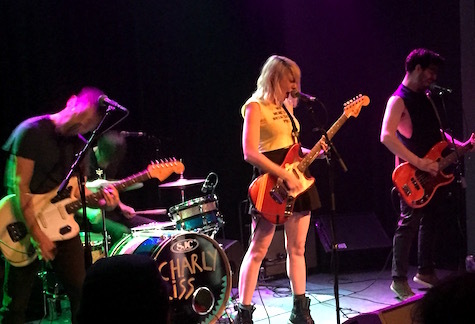 Charly Bliss at Reverb Lounge, June 16, 2016. I was pretty spot-on with my original comparisons to Charly Bliss: Weezer meets The Breeders with Cyndi Lauper-esque vocals thrown in for good measure. What I missed (and what became more apparent from the Reverb stage last night) was the touchstones to ’90s band That Dog, who I assume frontwoman Eva Hendricks and Co. never heard of so it probably doesn’t count. Though if they listened to, say, 1995’s Totally Crushed Out, they may recognize similar melodic and harmonic tendencies, tendencies which I’ve always loved. When you consider the wave of female-fronted heavy/’90s-sounding bands currently stomping across American Indie — Diet Cig and Dilly Dally among them — Charly Bliss has one-upped them if only by having a better ear for melody, a broader variety of song styles and Hendricks’ unmistakable vocal style. When heard on the band’s earlier recordings, you got a sense she was always about to spin out of control in a glowing ball of uber-cuteness (Imagine Jennifer Tilly singing rock songs). But last night (and on the band’s recent single, “Ruby”) Hendricks keeps it under control, and it’s for the better, though she can’t help to let out a yelping scream-squeak every once in a while. We all knew we were in for something weird on the set’s last song when Hendricks unstrapped her guitar and put her pedal board away to give her more room to move. And move she did, like a girl possessed, hopping and thrashing her arms as if having a seizure while the rest of the band practiced their feedback-fueled riffage for what seemed like five minutes. She ended the number by pounding her belly with both hands much in the same way Charlie Babbitt pounded his head in Rain Man. Crazy fun from a band you’ll be hearing more from. Lightning Bug at Reverb Lounge, June 16, 2016. As for opener Lightning Bug, I think I’ll need to update that list I published yesterday. I’ve never caught these guys before last night, and now I’m sorry for all the previous nights I missed. In fact, I only caught the last three songs of their set and I’m a little pissed about that. An indie-rock four-piece, there’s a preciseness about their sound that elevates above garage and recalls Three of a Perfect Pair-era King Crimson, thanks to frontman David Moore’s at times intricate guitarwork, which swapped between old-fashioned tapping technique and all-out riffage. Add Moore’s tuneful howl — one of the more unique voices I’ve heard from an Omaha band — and they’re onto something. I ran home and listened to their Soundcloud recordings since they weren’t selling anything at the show (that I could see). When’s the next show, boys? Tonight at fabulous O’Leaver’s electronic post-punk band Silversphere headlines. The band features Owen Cleasby and Ken Brock, who you may remember from the previous incarnation as The Lepers. Opening the show is gritty garage rock goodness of Worried Mothers and new trio, Was. $5, 9:30 p.m.
Also tonight, local punk band No Thanks has a tape release show at Milk Run. Opening is Bien Fang and Super Moon. Show starts at 9:30 p.m.
Proseeds, a local firm that helps generate money for non-profits, is hosting a free local music festival at Stinson Park in Aksarben Village Saturday evening. Among the performers are All Young Girls Are Machine Guns, Routine Escorts and State Disco. See the full line-up here. Tomorrow night (Saturday) it’s back to O’Leaver’s for Those Far Out Arrows. 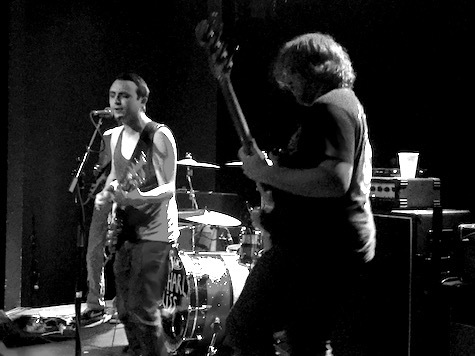 Opening is Heavy Lungs and KC band Psychic Heat (High Dive Records). $5, 9:30 p.m.
Start your evening off early Saturday with an in-store show at Almost Music in the Blackstone District. On the card are Topeka experimental act Aaron Martin with Erinome (Aaron Hansen) and Sopor (Zach Schiermann). $5, 7 p.m.